These bright orange tires have been manufactured to our exacting specifications for use with the Shopsmith Bandsaw. Made from a special urethane compound, they will improve blade tracking (especailly with smaller blades)... repel sawdust build-up and provide added durability over our standard rubber tires. 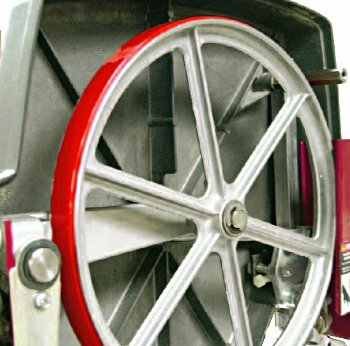 To install, submerge in hot (125° - not boiling) water for about 15 minutes to soften them and stretch them onto your bandsaw wheels. No glue required. The "welds" on these tires are guaranteed for life. If they should fail, simply return them to the manufacturer for a replacement. Cool blocks lubricate your bandsaw blades, keeping them cool, extending blade life. 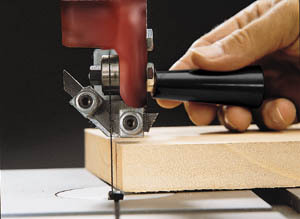 Offsets your bandsaw just enough to allow you to raise your Mark 7 / Mark V without having to remove your bandsaw.